Virtually everybody watches birds at times, but not everybody is a birdwatcher. There is no clear definition of this term coined in 1901, but if you actually watch birds with some interest, whether serious or casual, you are a birdwatcher. Maybe you spend a minute looking our your kitchen window observing a flicker or robin probing the ground for insects while you sip your coffee. Perhaps you marvel at the pigeons nesting on the office building across from yours while you daydream and gaze at them from your cubicle. Or maybe you stroll through the woods alone or with a group of Auduboners, actually seeking out birds. You are all birdwatchers. You can spend a lot of time birdwatching, going on weekly hikes, or even travel the world on a birdwatching adventure. 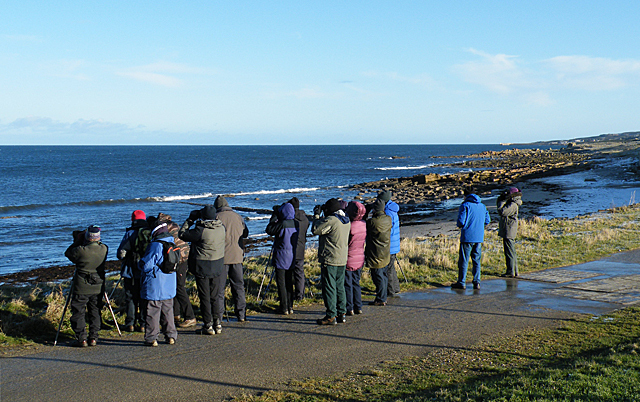 So what is the difference between a birdwatcher and a birder? It’s a matter of degree. Birders are more intense, more dedicated, more serious about the hobby and are sometimes offended by being called a birdwatcher, even though that’s what they really are. While birdwatchers own a cheap pair of binoculars and a beat-up bird field guide, birders tend to have several pairs of binoculars, including a very expensive one, plus a spotting scope. Birdwatchers may keep a list of the birds they have seen, but are not very diligent about it. Birders are obsessive about keeping a life list, and often maintain country lists, state lists, county lists, and even zoo and tv lists of the birds they have seen. Birdwatchers might spend a few hours in the field on a birdwatching day, while birders arise before dawn, bird all day, and look for owls at night. Every person who watches birds has his or her own style and dedication to the hobby. Honestly, as a professional ornithologist, I consider myself a birdwatcher rather than a birder. I just can’t get too obsessive about birdwatching, although I admit to spending many, many continuous hours in the field watching birds in the process of scientific research. I’m happy being a birdwatcher.